Generic Company Place Holder Where To Eat? Find restaurants using GPS. It’s nearing lunchtime as I write this review, and boy, am I ever hungry. Ordinarily, I would simply stand up, walk 10 steps to the fridge and make a sandwich or something. But in the service of this review, I’m going to use Networking 2.0’s $3 Where to Eat? to answer the question, what to eat? On the Menu: Where to Eat's interface is a little on the bland side, but it can help you find places to eat by food type. When you launch Where To Eat, you’re confronted with a standard menu of cuisines and food types. The interface, I’m sorry to report, is a bit bland and could use some spice. The app uses the iPhone and iPod touch’s location features to let you browse all restaurants near your location. You can also narrow your browsing options to cafés, pubs and bars, fast food, take-out, and delivery. Shake your iPhone or iPod touch, and Where to Eat? will throw out a suggestion. How about a café? I said I’m hungry! How about Moroccan? No thanks. British? In the Inland Empire of Southern California? Let’s see… There’s the Royal Falconer Pub in Redlands, which is about 25 miles away from my desk. Not a quick trip. I’ll need to remember that one for later, though. Italian? As it turns out, there is only one authentically Italian restaurant within 5 miles of my current location. Everything else is corporate pizza delivery. Eh… no. As with FutureTap’s Where To? app, Where to Eat? relies on Google Maps to locate nearby eateries. When you tap on a particular category of restaurant, the app will launch Maps and display pushpins of the locations closest to you. You can also display the locations in list format. And as with Where To?, Where to Eat? takes you out of the app, which means you need to relaunch if you don’t find what you’re looking for the first time (which, for most people, will be more often than not). Why the developers don’t let users simply tap a back button is another one of those iPhone app mysteries that frustrate my days and plague my nights. Where to Eat? is cognizant that people do have their favorites and are creatures of habit, however. The app lets you pick favorites and keeps track of your recent searches. Missing from the app itself is any social media awareness. It would be useful in some instances to e-mail directions to a restaurant to a friend or client. For that matter, in this peculiar age, someone, somewhere, may want to share their lunch or dinner location on Twitter or Facebook. You’re free to do so_but not with the help of Where to Eat. In all, Where to Eat? 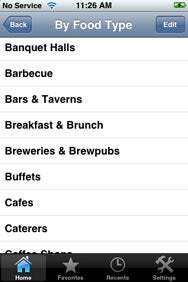 is a perfectly adequate restaurant locator, but without the extra functionality that would make it a truly go-to app. As for lunch, I think I’ll pop over to the fridge after all. Where To Eat? is compatible with any iPhone or iPod Touch running the iPhone 2.0 software update.